Anderson appeared on The Chew this morning cooking with Mario Batali. Anderson's chopping skills may need some work! A company accused of supplying faulty protective equipment to hospitals during the most recent Ebola outbreak also sold the equipment to the U.S. government's Strategic National Stockpile for use in future outbreaks and emergencies, Anderson Cooper reports this week on 60 Minutes. The story airs this Sunday, May 1 at 7 p.m. ET/PT. Cooper's investigation focuses on Halyard Health's MICROCOOL Surgical Gown, which is supposed to meet a rigorous industry standard known as AAMI Level 4, meaning it is impermeable, so that blood and body fluids containing dangerous viruses like Ebola can't get through. The Centers for Disease Control and Prevention (CDC) recommended AAMI Level 4 gowns for use during the Ebola outbreak. But 60 Minutes reports that when the government's National Institute for Occupational Safety and Health commissioned tests of MICROCOOL gowns produced in 2014 for the national stockpile, there were some sleeve seam failures in three out of four batches tested. Bernard Vezeau, Halyard's former global strategic marketing director for MICROCOOL, tells Anderson Cooper the MICROCOOL gowns didn't consistently meet industry standards. "They would leak when we pressure tested them," Vezeau says, "especially in the seams." California attorney Michael Avenatti shows Cooper a December 2012 laboratory test report of MICROCOOL gowns, commissioned by one of Halyard's competitors, Cardinal Health. According to the report, 77 percent of the gowns tested failed the industry-recognized test on one or both sleeves. Avenatti represents hospitals that are suing Halyard Health in civil court for fraud. "Forget about the civil liability," he tells 60 Minutes. "This is criminal conduct." But Chris Lowery, the Chief Operating Officer of Halyard Health, tells Cooper the test commissioned by Cardinal Health is an "extreme outlier" that is not consistent with the company's own laboratory tests. Lowery says the allegations against the company "aren't based in the facts...We get less than one complaint for every million gowns sold. And... we've never received even one report of a health care professional contracting an infection as a result of a flaw in our product." Halyard Health was a division of the Kimberly-Clark Corporation until it was spun off into a separate company in November 2014. The government's Strategic National Stockpile of medical supplies is maintained by the CDC. 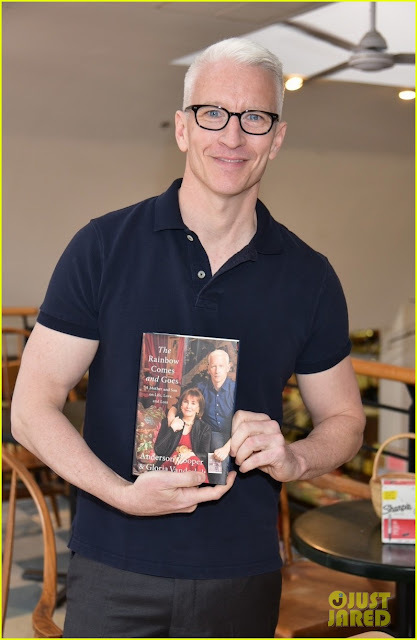 Anderson Cooper's investigation was produced by Andy Court and Sarah Fitzpatrick. Anderson Cooper was a guest on The Late Show with Stephen Colbert on Friday night. (The segment was taped Thursday afternoon.) Enjoy! 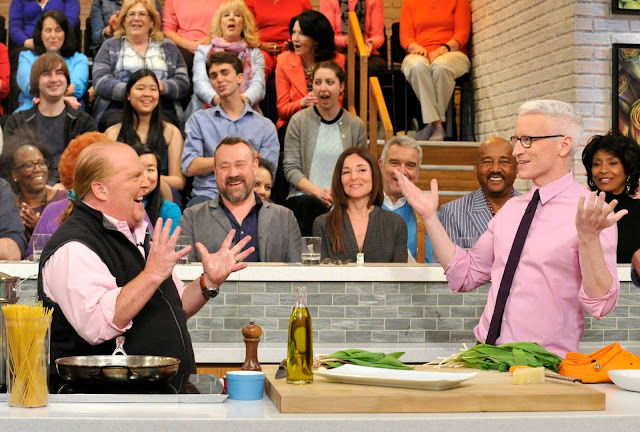 Tomorrow (Friday) Anderson has scheduled appearances on The Chew and The Late Show with Stephen Colbert! Mr. Cooper is a busy man! 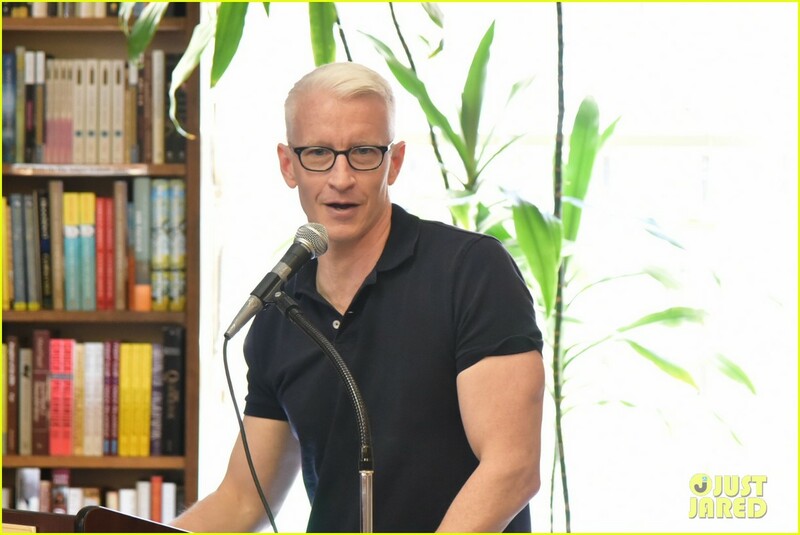 Anderson Cooper anchored an expanded two hour edition of AC360 from the NYC studio. Much of the two hours was spent on The Donald. A couple of segments caught our attention and not necessarily for good reasons. The first was with David Gergen and Lt. Gen. Mark Hertling (Ret.) discussing The Donald's foreign policy speech today. We once looked forward to the wise counsel of Gergen, but now he seems totally in Trump's corner and never misses a chance to take a swing at President Obama. Thankfully, Hertling was on to point out the at times incoherent rambling the The Donald touted as a foreign policy speech. Next up was a segment on Trump accusing Hillary Clinton on playing "The Woman Card" and AC360 had on Trump supporter Clueless Kayleigh who just makes us do a head desk. 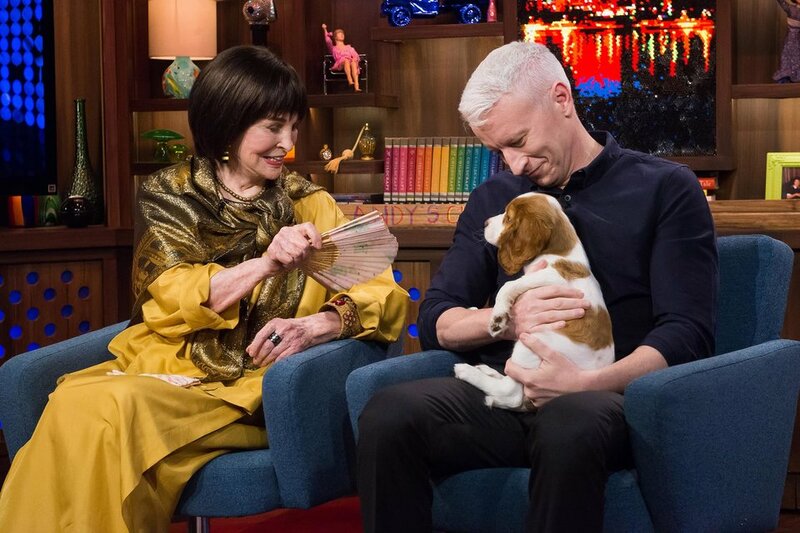 And as per usual, Anderson gave her the last word. In the second hour there was a panel on the path for Clinton and Trump after last night and Christine Quinn was brought in and she gave Clueless Kayleigh push back on "The Woman Card." The program ended with a story on the sentencing of Former Speaker of The House, Dennis Hastert today. This was the lead story on NBC Nightly News with Lester Holt, but was given 4 minutes and 24 seconds on a two hour AC360 and Anderson complained about the story being swept under the rug. This has been in the news for over a year and there has been a lot of coverage in the Chicago media across many platforms for the last month. If CNN could pull their eyes away from Trump's every move and covering his every sneeze, perhaps Anderson wouldn't be surprised by the story? Here's the segment that was obviously taped earlier in the day as Anderson is wearing a different tie when speaking to Jeff Toobin. Anderson Cooper was in CNN's Washington DC Bureau for Super Tuesday 4 coverage. Coverage began for Anderson at 5pmET with Wolf Blitzer in The Situation Room and continued through the 1amET hour. Anderson spent his time moderating giant panels about the results of the primaries in 5 states. With tomorrow night being Super Tuesday #5 it will be at least Wednesday before we get any more non-political news on AC360. Anderson Cooper received Yale's Undergraduate Lifetime Achievement Award today and the very capable John Berman was in the AC360 anchor chair. Anthony Bourdain and Anderson Cooper talk about the cuisine of the Philippines. "Parts Unknown" goes to the Philippines Sunday at 9 p.m.
Anthony Bourdain challenges Anderson Cooper to taste some of the hottest dishes at Mission Chinese Food in New York City. Anderson "re-tweeted" the above tweet with a link to an iTunes podcast promoting his book. 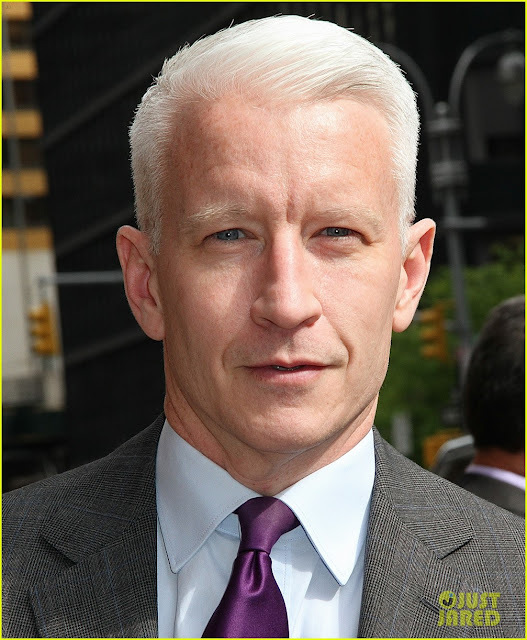 Anderson Cooper anchored an expanded two hour edition of AC360 from the NYC studio. The program was mostly a rehash of last night's NY primary and what the results mean going forward. Also covered in the second hour was a segment on the charges in the Flint Water Crisis, the flooding in Houston and Anderson did a report on Harriett Tubman coming to the $20 bill! 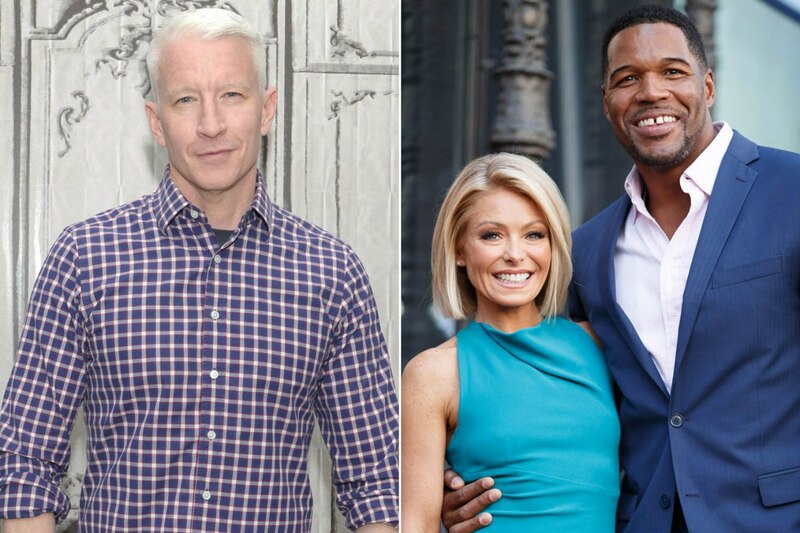 After ABC News President James Goldston announced in a memo Tuesday that former New York Giants star Michael Strahan would exit “Live With Kelly and Michael” to move full-time to “Good Morning America,” speculation immediately began over who will take his role. 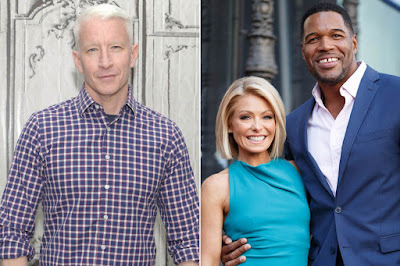 Sources told Page Six on Tuesday that Ripa’s close pal Anderson Cooper is now the front-runner to replace Strahan, who came on as co-host with Kelly Ripa in 2012 after Regis Philbin retired in 2011. The show had tried out a string of guest hosts at the time including Cooper, Seth Meyers, Neil Patrick Harris, Ripa’s husband Mark Consuelos and Jeff Probst. Cooper’s contract situation at CNN puts him in a prime position to take over. In 2011, “Anderson had just signed a deal to do his own daytime show,” ruling him out of the “Live” job, an insider said. His syndicated show ran till 2013, “so he has experience doing daily daytime.” Cooper’s CNN contract reportedly ends after the election. But an ABC source said that “Live With Kelly and Michael” will look to replace Strahan “in the fall with the start of the new season. They had a lot of fun with it last time . . . It took about 10 months before they settled on Michael.” Strahan will leave over the summer. A different TV pro explained Ripa was keeping the troops together behind the scenes after the surprise announcement: “She was on for a long time before he showed up. 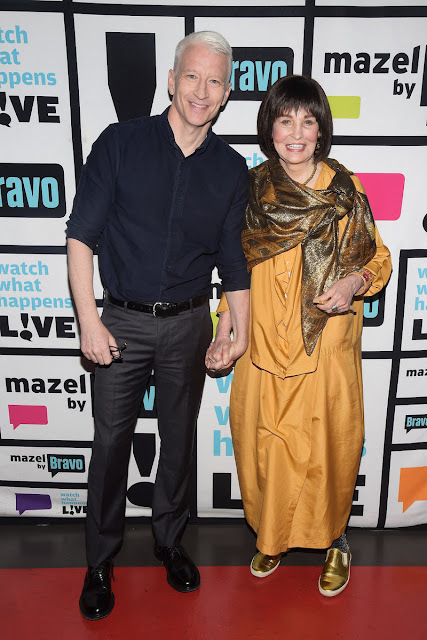 He thought he was the strength of the show.” Yet another insider said Ripa “is the queen bee of the show, always has been.” More reason she might replace Strahan with a close pal. Reps didn’t comment. Anderson Cooper joined Wolf Blitzer in The Situation Room, anchored a special edition of AC360 and then co-anchored CNN's New York Primary election coverage until 2amET. It was all political/primary coverage for hours on end. Anderson was a guest on The Howard Stern Show Monday morning. They posted a few clips where Anderson discussed CNN Town Halls and not voting among other things. Anderson Cooper anchored AC360 from the NYC studio. The hour's topics consisted of Bernie Sanders release of his 2014 tax return, Donald Trump's complaints over delegates, John King breaking down the numbers and a lion tamer who was killed at a US zoo today. Anderson Cooper anchored a two hour AC360 Post Debate Special from 11pm-1amET. Chris Cuomo was in the anchor chair for the AC360 Pre-Debate program as Anderson and his mother were in conversation at the 92nd Street Y at 8pmET. Both programs were all politics centering on the Debate hosted by CNN.